I’ve just done another pass through the spaghetti factory that is my Diplomatic code. The catalyst was another one of those unintended consequences that occur when you make a major conceptual modification to your code base. Excommunication from the Infernal Conclave was something that I had in my basic design and I had mentally followed the rabbit hole to see where it plugged into my architecture… more or less. I realized last week that it had really just been stubbed out for the most part. Well no time like the present I thought so I set about fixing that. I never even got to the mud wrestling contest. The Excommunication status for a player means that they can’t win the game in the normal way. Prestige is meaningless for them. If they want to win they need to take Pandemonium by force and hold it for several turns. In the mean time it’s everybody’s hand against them and the Conclave awards bonus prestige points for hammering the Heretic. I had to go back and make sure players still in the Conclave couldn’t make diplomatic orders directed at the Heretics and the Heretics of course are cut off completely from demanding, insulting etc because for them it’s moved beyond that. The Regent system also had to be modified to skip the Heretics when the Infernal Orb and Scepter were being passed around… which means no new Event Cards are drawn by the Excommunicated player. The short of it is that the plumbing all needed a thorough pass to resolve conflicts and unexpected interactions. Just to explain the Excommunication system a little more, you should rest assured that it is pretty rare. You can choose a course of action which is certain to get you the boot but having it happen to you without your deliberate choice is presently only possible by means of one event card… 1 of about 60 distinct events so the chances aren’t great plus the event chooses a random player plus there is a vote taken first by all the players in good standing with the Conclave… so lets say it’s pretty rare. In order to get yourself excommunicated from the Conclave you simply have to try and take and hold Pandemonium, the capital of Hell. It’s well guarded though and if you can’t hold it and your stronghold then you don’t trigger the alternate win condition. If you hold them both for a set number of turns during which it’s you against everyone then you win the game. If you can’t hold Pandemonium then you are still in the game but you discover you have been excommunicated the moment you violated the neutrality of Pandemonium and now it’s your only win condition…..except for that other 1 of 60 Event Card that let’s you forgive and forget and bring the heretic back into the fold… hopefully you drew that and had it saved as a back up….or maybe somebody would rather have you hammering away at a pesky neighbor so they play it for you…. you never know how Machiavellian it can get in hell. So now it occurred to me that another alternate win system might have some unintended consequences that I hadn’t fully taken into account. In this case it was the Blood Vassal system. The idea was to try and mitigate some of the early loser/hopeless sad sack cases that you often get in multi-player strategy games of all stripes. Sometimes you just get a bad start, some bad rolls or some bad decisions and you end up a rump player with a rotting carcass that the other players just finish off like circling buzzards. You are out early or mid game. Or maybe you are hanging in there but it’s pretty obvious that the guy playing Abyssia or Ermor is just going to run away with it so why keep on jogging. The Blood Vassal system is designed to help alleviate that. It’s not a one shot wonder but there are other mechanisms that also help. Secret objectives mean that you can reveal hidden prestige that you have accumulated over the course of the game. A couple of perks for your Avatar can be bought for an expensive price to influence the win conditions at the end of the game. And assuming your aren’t a heretic (see above) then conflict is very structured and channeled. Players can’t even enter your stronghold hex to rub you out and banish you to the Abyss unless they have formally claimed Blood Feud and that takes some effort. But let’s get back to the Blood Vassalage: Basically you send an emissary to a more powerful player and say hey I’ll be your lieutenant… your vassal and in exchange I can’t win but if you do I’ll take second place no matter who has the next highest prestige. There are some advantages and disadvantages built into this of course. The Blood Lord get’s half the Blood Vassals prestige at the end of the game. That’s a big plus. But the Blood Vassals Prestige is halved the moment the relationship is sealed so it’s a medium to long term investment in most cases. The Blood Vassal is reduced in rank to the lowest rung on the ladder and the Blood Lord is promoted a rank. The Blood Vassal is excluded from an active role in the Conclave… no regency turns to draw events, no separate diplomatic actions. The diplomatic stance that any player has with the Blood Lord applies to the Blood Vassal as well… including excommunication. This provides an interesting decision for the players and can facilitate the balance of power struggle as the end game approaches. There is one final mess with your head twist I threw in as well. 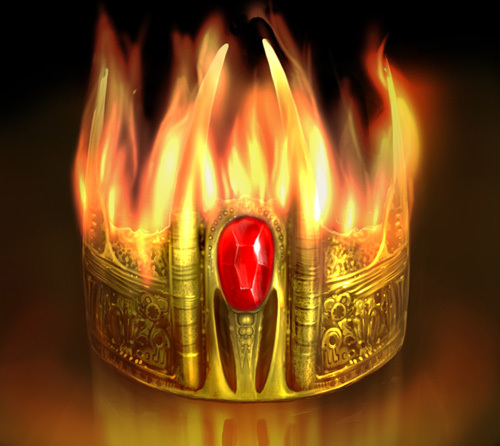 Players can buy the “Power Behind the Throne” perk for their avatar for a hefty amount of build points (it’s a big strategic decision and should not be attempted frivolously). This perk makes you the winner if you are the Blood Vassal to a Blood Lord who wins the game. Something to think about when you get a message saying an emissary has arrived bearing a petition to become your Blood Vassal. Oh and of course you can only have one Blood Vassal or be the Blood Lord for only one other player. There are a bunch of other aspects to the relationship as well….mutual support for legions, right of passage for legions etc. Advantages and disadvantages to be pondered. Heavy is the mind of he who wears this crown, for prophetic sight is rarely a gift. Visions are not definitive states of the future. They are merely its possibilities, and so the bearer of this headpiece must determine against which insights he shall prepare. Consider the future. Weigh it carefully. Paranoia is a greater foe than a Fiend. I caught this interesting news bite over at Tom Chick’s Fidget. It seems that using The Inferno as a thematic setting is getting some serious consideration from the giants of the industry. With M rated games like Oblivion and Fallout 3 doing so well though it’s not surprising that designers might venture below. The nice thing about my niche though is that nobody is building a turn based strategy game down there. Sure Brad Wardell and Co. at Stardock are working on Elemental but that’s a different league and I need TBS’s to play like the next guy so no worries there. Seeing Stardock continue to pursue the TBS genre gives me hope that my niche won’t become a nichette. Solium Infernum is PG-13 by the way. This is probably the most “mature” image in the game. Meet the Queen of the Damned. I’ve just recently added her to the game because “feature creep” is my middle name. She is one of four Champions of Pandemonium that you can challenge with your Praetors (heroes) in single combat to win some prestige. A word of caution though: She’s a killer. Dynamite with dual scimitars. You are currently browsing the Forgotten Lore blog archives for November, 2008.